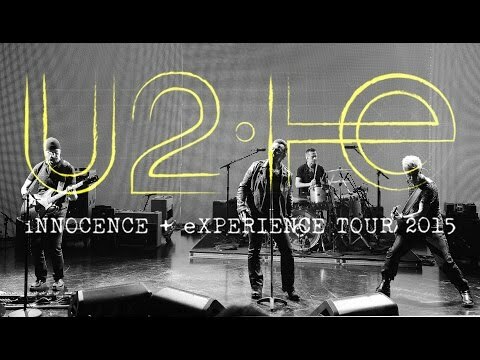 They are not the first band to do it, they won’t be the last, but damn are U2 rocking their digital content now they are on tour. iNNOCENCE + eXPERIENCE 2015 kicked off a few weeks ago in Vancouver, and ever since the first night the band’s social media coverage has been really fun to follow. For those of us who deal with content marketing and user experience, what U2 are doing is also a useful reminder of how much the relationship between a b(r)and and its audience is continuously being reshaped and redefined—to the point where the show itself is becoming just one part of the entire experience. 1. FACEBOOK: Do You Feel Loved? The band’s Facebook page is updated several times a day, with each post receiving thousands of likes, comments and shares (good luck to whoever is moderating that). 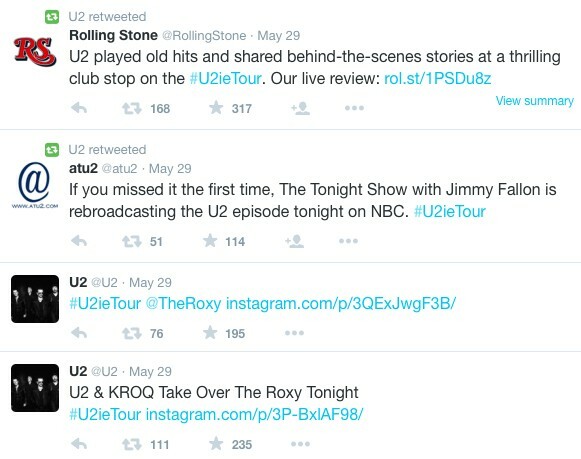 From links to band- and tour-related articles to exclusive backstage pictures, the page gives fans all the most up-to-date information about the band and their whereabouts, so that followers never have to look anywhere else if they want to know what U2 are up to. Twitter is the place to be for people who are not going to a show but want to feel like they are there anyway. 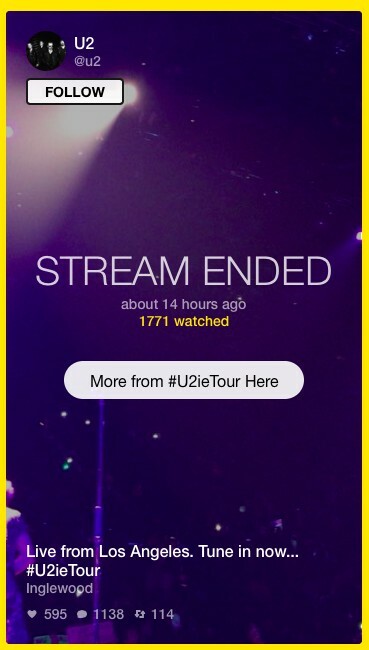 The dedicated hashtag #U2ieTour lists almost everything about each show—and if that’s not enough, from the Twitter page people can also follow links to the website where, every show day, a livestream integrates tweets, clips, selfies, photos and whatnot. Speaking of which: fans who have always wanted to know what Adam Clayton reads before bed or what colour toothbrush he uses (? ), now can. 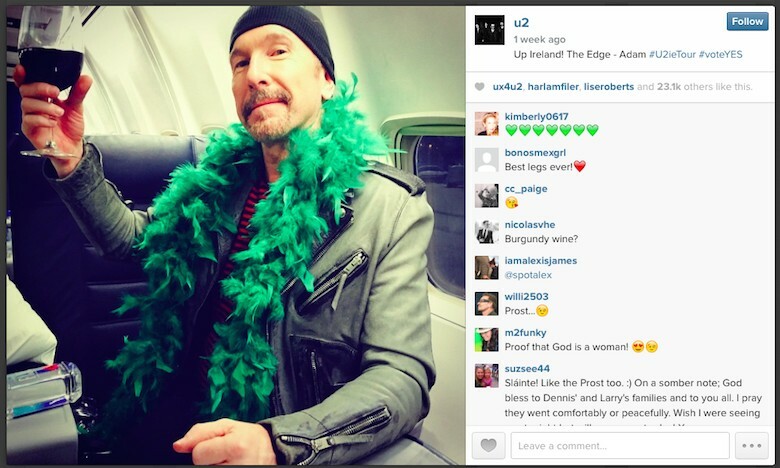 Rejoyce, people: U2’s very new Instagram page hosts a wonderful collection of exclusive behind-the-scenes (though no selfies from Bono… yet), giving audiences a privileged insider look into what goes on when the band is not on stage. 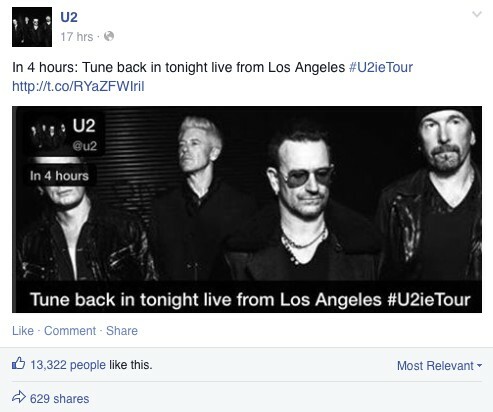 This is U2 proving that even the newest apps can be used to connect with your audience to offer the raw, unedited, ‘real’ content experience they are looking for. Of course this is just the tip of the iceberg—but it’s been barely three weeks, and the shows have already become just one part of the entire b(r)and experience. I look forward to seeing what happens in the next few months.